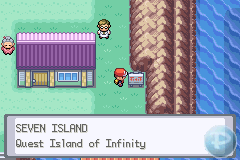 Seven Island, Quest Island, is home to the Trainer Tower - simply surf north to get there. The main attraction of Seven Island at this stage, however, are the ruins to the south. Bring along someone with Surf and Strength, and if you want to catch some Unown now, some Pokeballs as well. 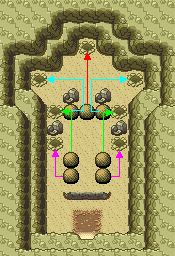 Walk through the grass and you'll eventually meet two Cooltrainers at the top of some stairs. Head west from the bottom of those stairs into the cave entrance. Here's the solution to the puzzle: follow the direction of the red arrow first, then the blue arrows, then the purple, and finally the green. Once you've completed the puzzle, there will be an earthquake and you'll be able to start catching some Unown. Continue to the south of the island until you reach some water. There are seven ruins scattered across the water here that all together hold the 26 Alphabet Unown, as well as the two new ? and ! Unown. At the back of the rooms are coloured tiles that have been noted in the table below.